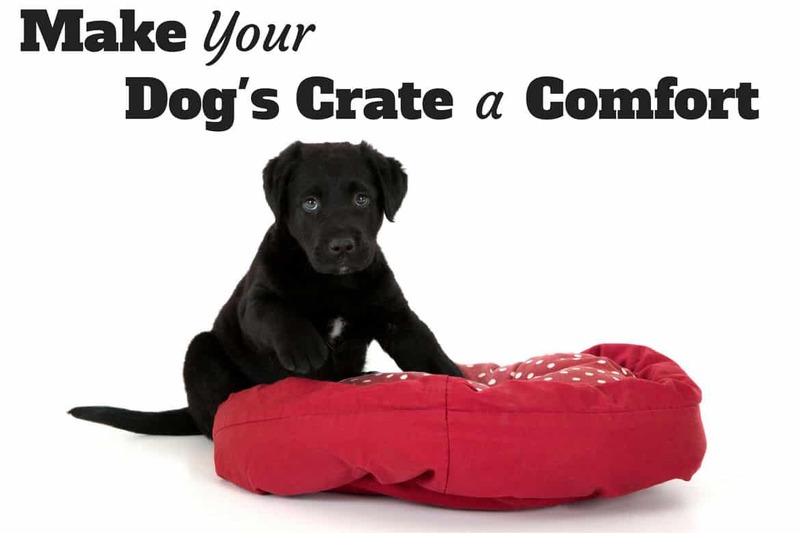 After selecting the right size crate (and if you need help, please see our handy dog crate size guide) you want to make it a pleasant and welcoming place for your dog to spend time in. You need to add a few ‘creature comforts‘. 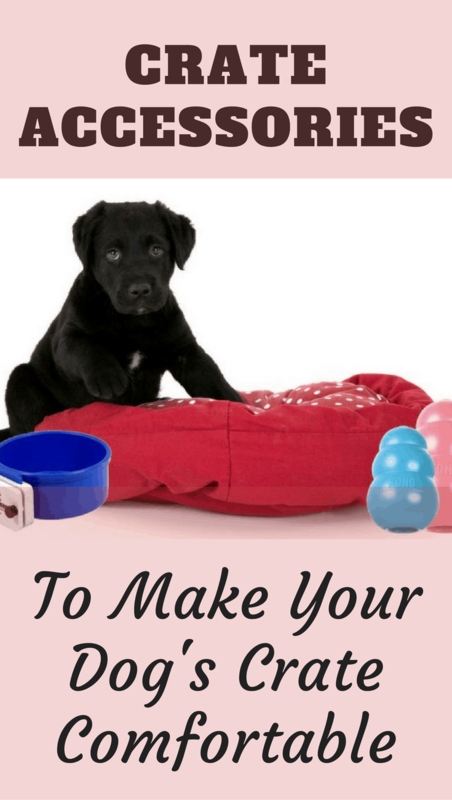 You will definitely want to add bedding, should put inside some durable chew toys and if you’re going to crate your dog for any length of time, you should add a supply of water too. 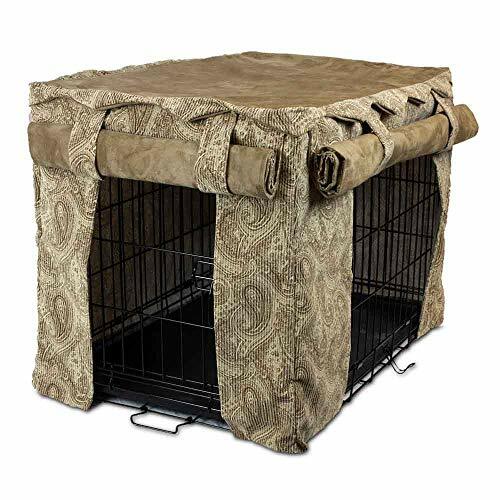 It’s also worth considering a crate cover because many dogs prefer the more enclosed, den like feeling it offers and feel more comfortable and happier to spend time inside when it’s covered. Sadly, a new puppy will quite often feel loneliness and separation anxiety after being taken away from their mother and litter-mates to sleep on their own in a new house. This often leads to endless crying and sleepless nights for all concerned. Eases crying, loneliness and separation anxiety by giving a new puppy the feeling of sleeping next to their mother or litter-mates. Has a real feel, battery driven heartbeat and internal heat packs. This means they can snuggle up to, hear the heartbeat and feel the warmth of the snuggle puppy, just like cuddling up with another dog. This has been proven to comfort a puppy and can help stop their crying at night. Heat packs are either microwavable, or disposable. Battery for heartbeat lasts 2 weeks of 24/7 use. Warm and comfortable bedding is an absolute must and although you could use old blankets and towels, you’re far better off using specially designed bedding. For adult dogs or puppies that no longer chew their bedding and are clean inside their crate, I recommend a warm, stuffed and possibly synthetic fur style bedding. For new puppies, chewers and dogs with incontinence problems, I recommend the Gorilla Crate Pad as it’s specially designed to withstand chewing and allows air and moisture to permeate through, keeping the dog dry if they have any accidents. From the manufacturers of the most popular crates on the whole of Amazon, this bed with over 1300, 5-star reviews, this bed is ideal for use in crates. 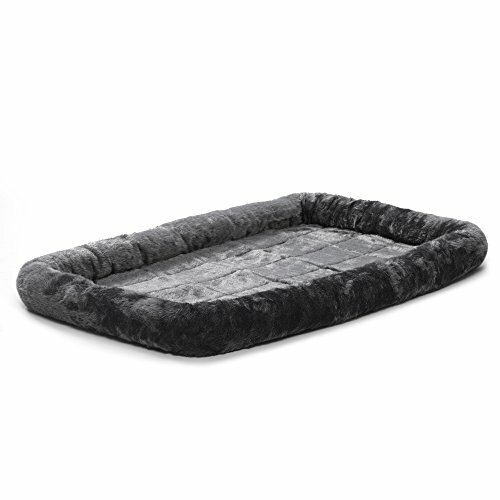 Made from ultra-soft synthetic sheepskin, highly cushioned and bolstered for the ultimate in comfort for your dog. Completely machine washable which is important for routine hygiene and cleanliness. Available in 7 sizes, there’s one to fit all crates and with 7 colors available, there should be one to suit most tastes. 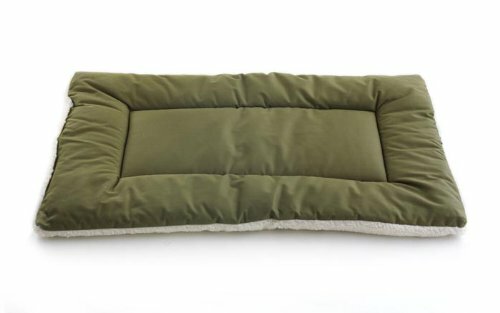 A 2 in 1 reversible pet bed that’s cotton for cooling in summer, and sherpa for winter warmth. Highly durable, made for and guaranteed to last through many repeated washings. Available in 9 sizes to suit every size crate and in 6 rich colors, there’s one to suit every need and taste. I must stress though, this bed is for a crate! 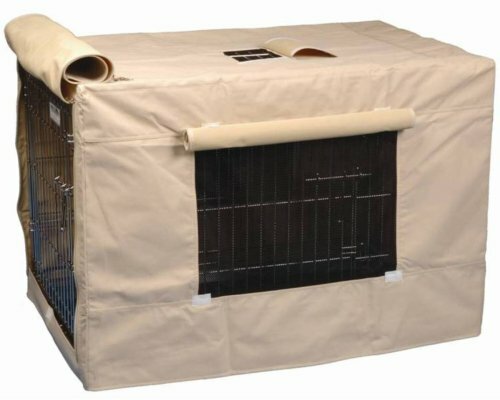 If you’re looking for a bed to use outside of a crate, there are definitely better options available! But or the price, durability and the fact loves it, this bed is ideal for going inside of a crate. Made by the most popular crate manufacturer on the whole of Amazon, with many hundreds of 5 star reviews from previous buyers. Designed to fit 7 standard crate sizes, this bed is ideal for all dogs young and old and all crate sizes. Blue paw print design with a synthetic sheep skin bottom. Can be machine washed and machine dried for convenient cleaning. Hygienic, non-irritant, non-allergic, permeable bedding that takes any moisture away from a dogs skin and allows air to circulate through it. Extremely durable and one of the most highly recommended types of bedding for dogs with a tendency to chew their bedding.  For 24″ crates: Click to learn more / Buy from Amazon. For 36″ crates: Click to learn more / Buy from Amazon. 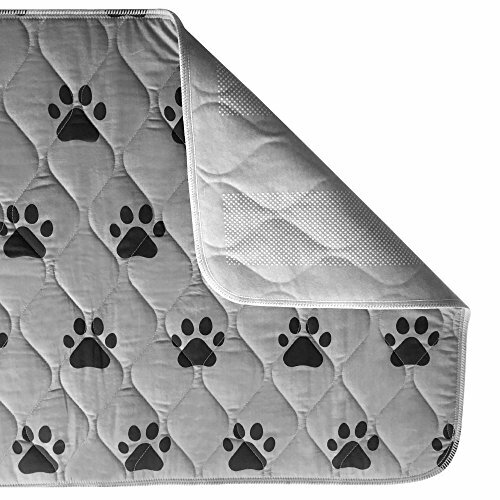 There is a huge variety of dog crate bedding available, with designs to suit every taste. I’ve shown here only the most practical, popular and best value bedding, but it may not be to your taste. The best crate bedding on Amazon, filtered to show only the highest rated and most popular. If you need to leave your puppy crated for anything longer than a couple of hours, you need to provide them with a supply of water. 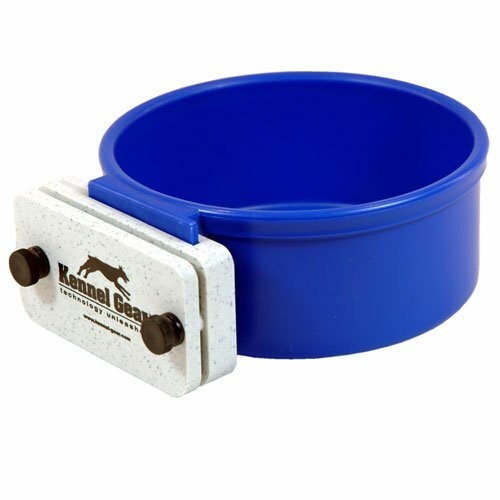 Secure locking, crate mounted bowls for food or water with and easy releasing lever. 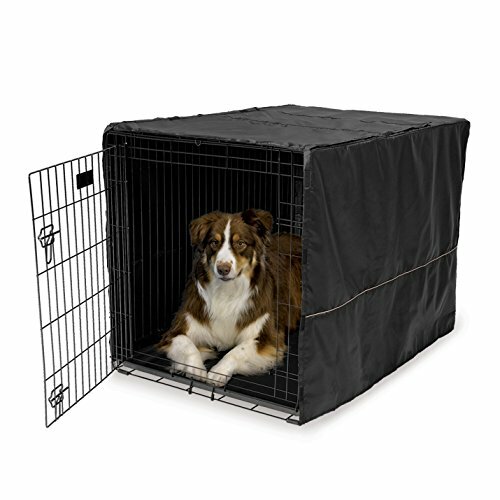 Prevents spillage inside the crate and keeps the area and hence your dog inside, dry and cleaner. 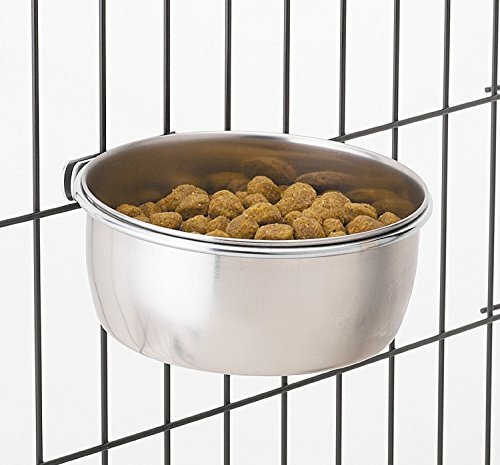 Bolts securely to any wire dog crate to provide an unspillable source of food or water. Made from extremely durable and easy to clean stainless steel, available in 5 different sizes from 8oz to 64oz. 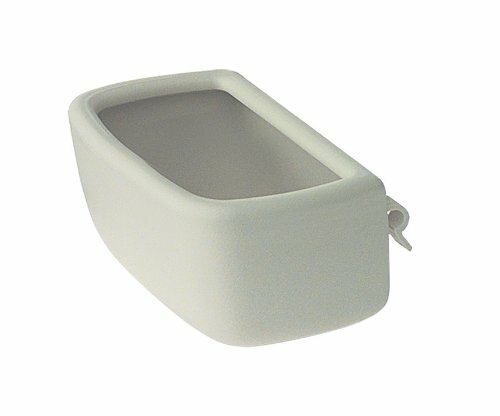 A universal bowl to be used for food or water that will fit to almost any manufacturers crate. Made from durable and easy clean plastic, with a ‘no-spill’ lip around the top edge of the bowl. Capacity of 24.75oz. Don’t worry if you’ve not been a bowl you like as this is just a small selection of what’s available. The best crate-mounted bowls on Amazon, filtered to show only the highest rated and most popular. Some dogs prefer their crate to be covered, giving them a more cosy den-like feeling than a bare, open wire crate where they can still see all around themselves. Also, for dogs that make a lot of noise in their crate, covering it can have a calming effect due to taking away the stimulation of being able to see all around. For dogs that struggle to settle down and relax, a cover is certainly worth a try! Extremely popular with excellent customer feedback, recommended by leading vets and trainers! Velcro tabs hold the cover in place while still allowing access to the front and side doors of 1 to 3 door wire crates. Made from durable, machine washable, machine dry-able polyester. 6 sizes to choose from to fit all popular models of wire crate. Opens on two sides to provide an access point suiting most crates and to control ventilation. Flaps can be rolled up and fastened, or let down for privacy. The cover itself attaches to the crate via velcro fastenings. It’s machine wash and dry-able, size shown is suitable for a 42″ crate and is ‘Amulet’ color, with other sizes and colors available on Amazon. 5 sizes and 4 colors available, fitting crates from all the major manufacturers. Very soft, very comfortable with side bumpers on the reversible crate pad. A very popular cover with fantastic feedback from previous buyers, more stylish and better looking in comparison to most other crate covers. Made from heavy-duty, water-resistant and machine washable fabric making it suitable for outdoor crates. Available in 5 sizes to fit most available crate sizes. Easy attached and removed with heavy-duty zippers, has roller shades providing means to adjust visibility and ventilation. A crate is a large object and highly visible in your home, so you’ll want to find a cover that suits both your taste and the decor of your home because they can be a bit of an eye sore! If you’ve not seen one you like, please click the following link where you can find a range of designs and styles that should suit every taste. 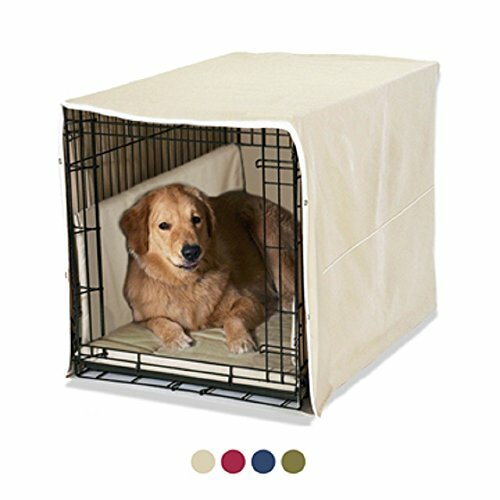 The best crate covers on Amazon, filtered to show only the highest rated and most popular. Chew toys are a fantastic thing to place in the crate for any and all dogs as they look forward to time with their chew toys, especially if stuffed with tasty treats. Having chew toys helps to form positive associations with the crate, keeps your dog or puppy’s mind occupied preventing boredom and can stop them chewing on the crate or their bedding if they’re going through teething. 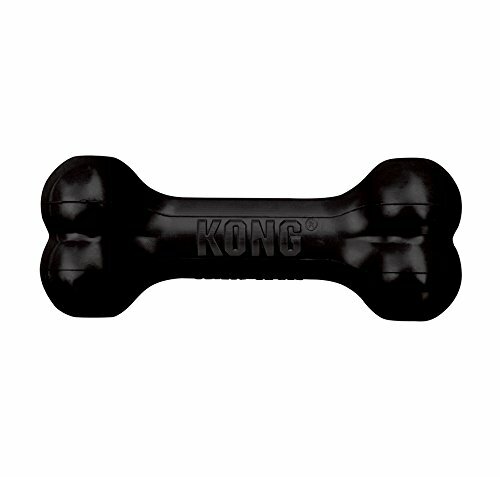 Made from Kong’s exclusive ‘teething rubber’, these puppy toys come highly recommended by vets and trainers worldwide. 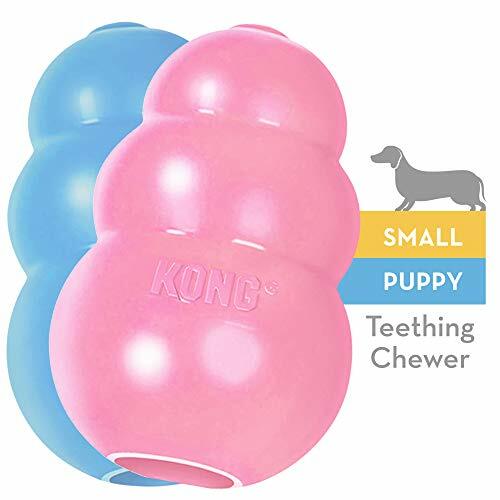 A smaller size toy compared to the original, perfect for puppy’s to chew and carry on their smaller mouths and perfect for stuffing with a puppy’s favorite treats to keep them occupied in a crate. Available in 4 different sizes to suit all breeds, but for a Labrador I recommend a medium for an 8 weeks to 5 months old puppy, then a large from 5 months up until finally upgrading to the classic Kong toy. A set of 3 Nylabone chews, specifically designed for teething puppies from powerful chewing breeds. Bristles raised as a consequence of chewing help to clean / brush the teeth and prevent build up of tartar. Come in 3 flavors of bone, chicken and bacon, guaranteed to be enjoyed by all puppies. THE most popular chew toy in the world! Recommended by vets and trainers. 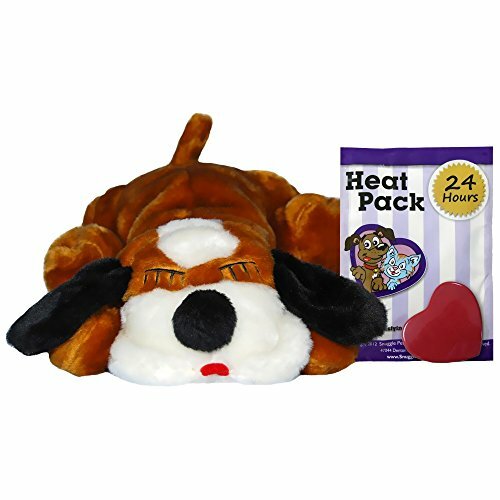 Extremely durable, perfect for stuffing with treats to occupy the mind of your dog and available in 6 sizes from XS to XXL. The large is perfect for a Labrador and if you have a very determined chewer I recommend the ‘Black / Extreme’ as it’s even more durable than the classic red. Natural rubber, extremely durable bone shaped chew toy for your dog or puppy. The ends can be stuffed with treats to make it extra special. Preferable to natural bones as there can be no splintering or swallowing of large parts. 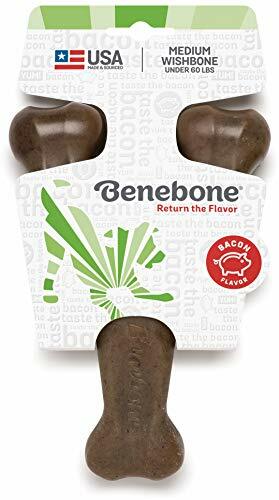 Real bacon flavor means dogs go truly mad for it and love to enjoy good, long relaxing chew sessions to keep them occupied and out of trouble. A unique curved wishbone design makes it easy to grab and more interesting than a basic bone shape for your dog. Safer than rawhide with no large soft lumps to be torn off and swallowed, safer than bones due to far less chance of any splintering. A good source of naturally occurring minerals such as calcium, phosphorous, zinc and magnesium, as well as durable and long-lasting. Elk antlers are an ideal chew for dogs. This one is medium in size, great for small to medium-sized dogs and puppies, though a little too small for adult Labrador’s. 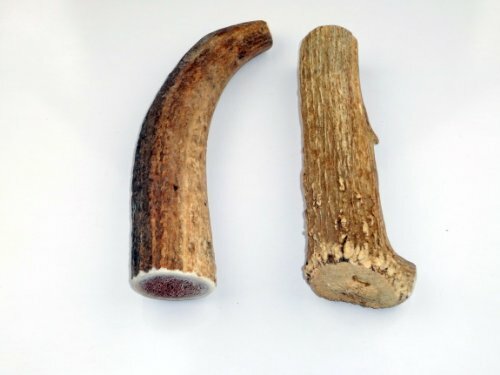 All the same benefits as the smaller antler chews for puppies, but far larger and ideal for large dogs up to 90 pound. Perfect for an adult Labrador, it will keep their jaws busy for days while adding essential trace minerals to their diet. Antlers are a good source of naturally occurring minerals such as calcium, phosphorous, zinc and magnesium so they’re healthy as well as fun to chew! There are almost as many chew toy designs available as there are dogs to chew them! I’ve shown here the most highly recommended, but of course they may not suit every taste…and variety is the spice of life so you might want to mix things up! If your looking for something different, please click the following link to see the huge range available at Amazon – The best place to buy due to the huge discounts always available. 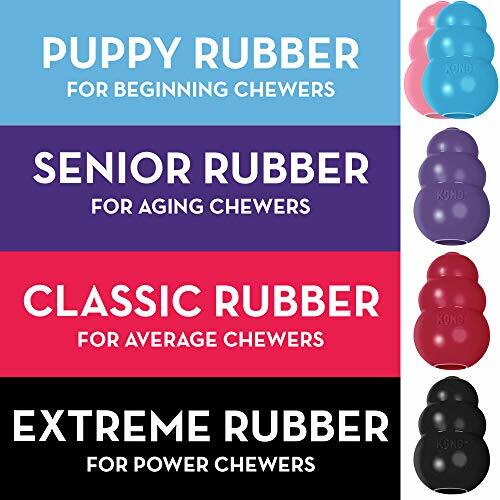 The best chew toys on Amazon, filtered to show only the highest rated and most popular. Where do you purchase vetbed in the U.S.?